Our Southeast and Texas Comprehensive Centers work closely with education leaders in Alabama, Georgia, Louisiana, Mississippi, South Carolina, and Texas to strengthen their capacity to drive school improvement and meet federal expectations. Turning around low-performing schools requires strong support, not only locally but also at the state level. However, state education agencies often lack the funds and staff to provide the extensive support struggling districts and schools need. SEDL’s Southeast and Texas Comprehensive Centers provide technical assistance and professional development to boost states’ capabilities and make the most of scarce resources. In addition, we identify targeted and innovative solutions to states’ unique problems—all to improve teaching and student success. In 2010, our comprehensive center work included helping Alabama train coaches for three major initiatives in academic language strategies for English learners. We assisted Georgia with implementing the Thinking Maps™ program to improve student achievement. We supported South Carolina and Louisiana in monitoring school improvement grants, and we helped Mississippi shift to the Common Core State Standards. In addition, for Texas educators, we developed a free online course on linguistic accommodations for English learners. Federal policies are often in transition, and new research is always emerging. For this reason, we also help state educators keep up so they can ensure their policies and practices meet federal expectations and incorporate the latest evidence. 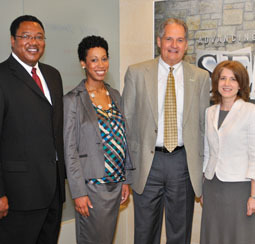 Our comprehensive centers hosted the regional forum “Turning Around Low-Achieving Schools: A Blueprint for Reform” on July 21–22, 2010, in Austin, Texas. Some 100 educators, including teams from each state we serve, attended. U.S. Department of Education officials discussed the blueprint for reauthorizing the Elementary and Secondary Education Act and received state feedback. Other sessions explored research-based practices for supporting proposed priorities. In addition, networking and planning sessions enabled state teams to learn from each other and strategize for the year ahead. For more information, please contact Robin Jarvis, Program Manager at 800-644-8671 or via email at robin.jarvis@sedl.org.